Home / automation testing / selenium grid / selenium ide / selenium ide video tutorials / selenium rc / selenium webdriver / selenium webdriver video tutorials / xpath / WHAT IS XPATH LOCATOR IN SELENIUM? 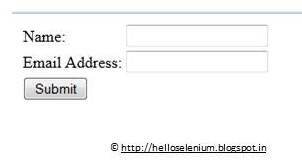 WHAT IS XPATH LOCATOR IN SELENIUM? is the xpath based on id for Name textbox in above html code. is the xpath based on name for Email Address textbox in above html code. is the xpath based on class for Submit button in above html code. is the xpath based on value for Submit button in above html code. is the xpath based containing text for Name label in below html code.